Admit it, you need help with picking out the right clothes for yourself. Unfortunately we can't all have our own personal Tim Gunn to help with the process. The apps on this list could serve as a viable alternative. Fashion–or as some of us like to call it, “I have no idea what I’m doing”–is no child’s play. It can take a lot of work, attention and insight to make sure that your wardrobe isn’t going to cost you a job, or a date, or the respect of your family and the general public. Done right, it can mean improvements to all of those areas, as well as putting a general spring in your step from the self-confidence that comes from knowing you look good. For many, it makes sense to seek help, and what better method these days than calling on the crowd? If you’d like to ask someone outside your circle if “I look fat in this,” or something similar, you could give these apps a shot. Styl is an app that uses its community to serve as a sounding board for anyone contemplating their clothing choices. At its core is a feature that lets users post a picture of an outfit to find out if it’s a hit or a miss. There is also the option of posting two images with two different looks to get an idea of which one works better–something of a real-world A/B test for style. Users are then given the results of what the community thinks of the outfit, in terms of the percentage of people who ‘liked’ it. Not just that–it also provides a detailed breakdown by demographic; the percentage of people in different age groups and by gender who gave what you wore a digital thumbs-up. Styl also has an e-commerce element to it; the app makes it possible to track the pricing history of products, get notified when an item becomes available, and make a purchase if you so please. Community engagement is incentivized with ‘karma points’, which can be exchanged for discounts and other rewards from retailers. Like Styl, The Hunt also has a voting feature whereby users can get feedback on their outfits by posting pictures of it. While getting second opinions is one part of finding out if you’re dressing right, the other would be getting help finding clothes that you believe would fit your form well. The Hunt is also an app that crowdsources information on where to purchase a particular piece of clothing, footwear, or accessory. Users start by posting pictures of the object of their desire–whether that comes from a Pinterest board, Instagram, or a picture they took themselves while creeping someone wearing something nice. They then post the picture to the app, where the community of online sleuths combine forces to help find the article over which the search has been called. If the community isn’t able to find the exact item, users can get advice on where to find something similar. Tapping into the wisdom of the crowd is helpful, but sometimes it’s best to turn to the experts. PS Dept is an app that combines the ability to get recommendations from fashion experts with a painless process for actually acquiring a piece of clothing of accessory. It’s something of a high-fashion equivalent of the other apps on this list, with the added element of a real-life personal shopping assistant (hence the ‘PS). All you have to do is contact the team with a request through a simple messaging interface; it can be as specific or generic as you like. The team scours the globe to find the item using its network of shoppers if it’s not available on online stores. Users are also given recommendations from expert personal shoppers based on their requirements. PS Dept. handles the entire checkout process, makes sure that the delivery happens on time and handles returns if required. 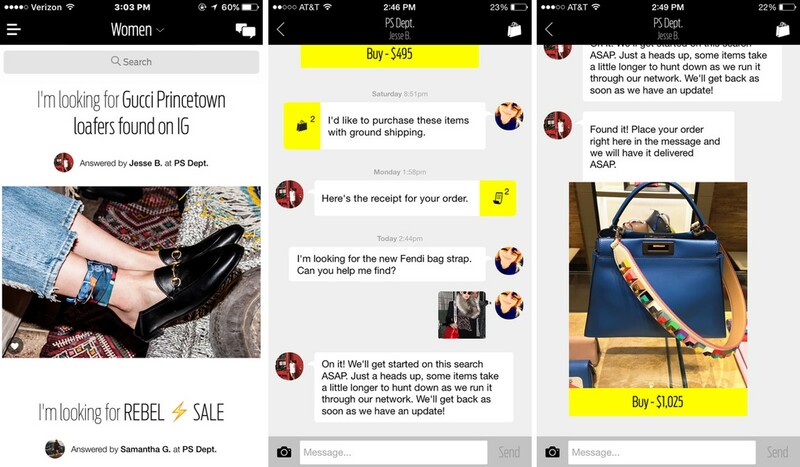 For users not currently on the lookout for anything, the app’s feed provides a real-time view of other users’ shopping requests and what kinds of items are trending. I get the draw to have an “expert” give you advice on what to where, but I would prefer the advice from friends or strangers through crowdsourcing like the other apps. Sometimes the strangers can be more honest with you. I think The Hunt offers the best situation for the application user here. You get the voting and the information on where to find a particular item of clothing. That is a bonus! I like the fact that Styl is sort of an A/B testing ground. That is the best way to know if you are getting the good advice on your clothes. Women do it all the time by asking, “do you like THIS, or THIS”. Just make sense. Finally, men have a chance to get the closet right without having to have a partner living with them 🙂 I really like the idea behind these types of apps that are allowing for real time answer and support. They are the new Google Search.